Ayo Fayose and his wife the first lady were at the Deeper Life Bible Church in Ado-Ekiti last weekend to give thanksgiving after the recent swearing in of the newly elected governor of Ekiti State. 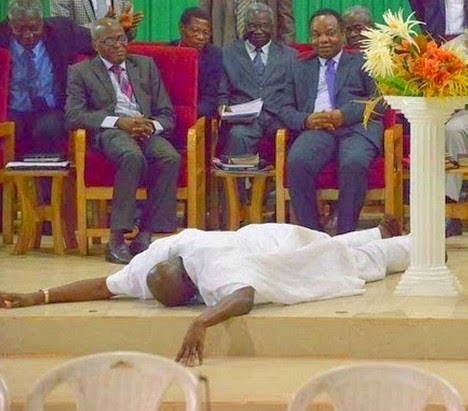 The above photo of Fayose reportedly laying flat down flat on the ground during his testimony, has now gone viral. “Having a second chance is very rare. If this time has been in Bible days, my name would have been one of the names to be recorded as those who God gave a second chance. “My return to government is not common in history. It is a rare miracle. During the seven and half years of my political wilderness, I was taken to Court over what I knew and knew nothing about 59 times aside the 45 days I spent in Ikoyi Prisons during my trial by the EFCC. “My Security aides and political aides like Chief Dayo Okondo were incarcerated for three and half years without committing any offence. I won’t allow sycophants to derail me again. All my property were left in the Government House because I had to run for my dear life. The first lady, Feyisitan Fayose, also spoke, and shared why she stands by her husband even though she had wanted him to leave politics at some point. “God revealed to me that my husband, Mr Ayodele Fayose, will return as the Governor, but He never told me the time. God told me that our return would be done in such a way that will beat the people’s imagination. At a time, I prayed to God to please push my husband out of politics. Later, God told me that He will leave him there for him to prove His power.